We don’t say this often, but ORIGIN AMINO has made the BWSB team re-think what a BCAA supplement can be. Here, we’re going to share with you why we’ve added origin amino to our regular intra-workout routine as well as are considering ranking ORIGIN AMINO #1 on our Best BCAA Supplements list. From month to month here at BWSB our team receives countless shipments of products from both new and established supplement companies. It really is nuts, some months we can get upwards of 5 massive boxes loaded with supplements! A few months back, a special box arrived… With the return address of ORIGIN Supplements. Upon inspecting the 3 sets of ORIGIN supplements, which consist of: ORIGIN PRE, ORIGIN Performance Whey, and ORIGIN AMINO – we realized: “Whoa, these supplement fact panels are SERIOUSLY legit”. And with that, we moved our ORIGIN Supplement reviews to the top of our priority list. Here, we are going to focus on ORIGIN AMINO. You can view our ORIGIN PRE Review here and our ORIGIN Performance Whey Review here. ORIGIN Amino has a formula to be proud of, with all active ingredients and dosages fully disclosed on the label. This is a relief to see, compared to the plethora of ‘proprietary blends’ that occupy much of the spotlight, containing subpar dosages. First and foremost, ORIGIN AMINO is a BCAA supplement. Origin Amino Contains 8 Grams BCAA (2:1:1) Per Serving. The first ingredient on ORIGIN AMINO’s supplement facts is BCAA in the favorable 2:1:1 ratio. How many grams of BCAAs? Eight! That’s double what most BCAA supplements contain. Is this too much BCAAs? From a marketing perspective, it is, as BCAAs are expensive. Hence why all the industry leaders supply 3-5 grams of BCAAs per intra-workout supplement serving. However, from a scientific standpoint, 8 grams is pure gold. Alternatively, 3-5 gram servings have very little effect when taken solo. We cover the research behind dosages more in-depth in our BCAA guide which you can find on our site. Origin Amino Contains 1.5 Grams of L-Glutamine Per Serving. Glutamine isn’t an essential amino acid, nor is it a BCAA. But, L-Glutamine is special for one thing – it’s the most prevalent amino acid in the body. With that being said, it’s quite important for growth, recovery, and general metabolism. As a whole, L-glutamine supplementation isn’t necessary for the average person. But, there have been a few studies which suggest that glutamine supplementation can benefit athletes. You can learn more about glutamine in our article: All About Glutamine Supplementation to learn more. 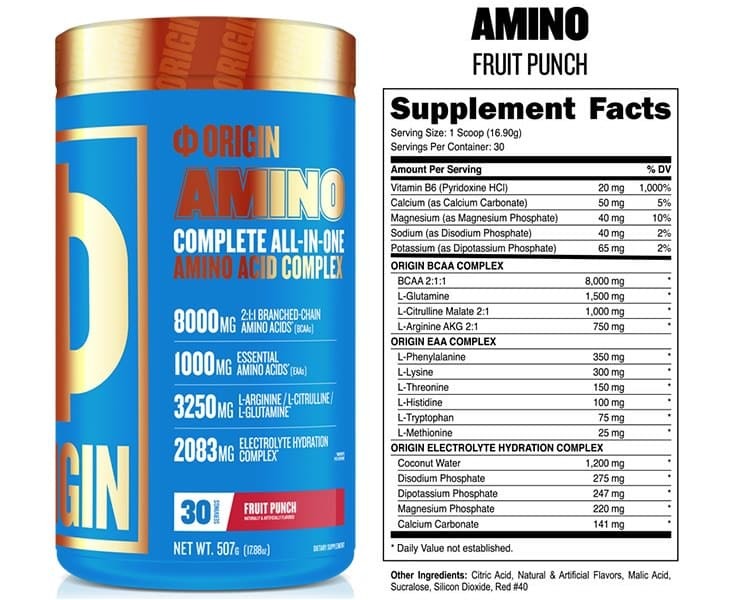 Origin Amino Contains 1 Gram of Citrulline Malate and 750 Milligrams of L-Arginine AKG Per Serving. The inclusion of Citrulline Malate and L-Arginine AKG are duel benefit bearing. First off, they improve circulation which will aid in the processes of recovery, fat loss, and growth. 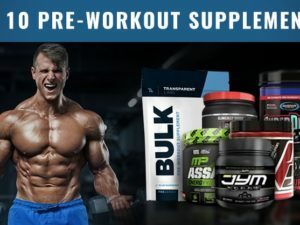 And second, the added circulation will boost the intra-workout performance of ORIGIN AMINO, as well as make it a valid stim-free pre workout on its own. While 1 gram of citrulline malate is not the ‘clinical dose’, we do believe that it will still offer benefits for both performance and recovery when taken into consideration its accessory presence next to the heavy hitting 8 grams of BCAAs. Origin Amino Contains 1 Gram EAA Blend Per Serving (separate from BCAAs). As we mentioned above, essential amino acids (EAAs) are not made by the body. Due to this, it is common for EAAs to be rate-limiting in specific bodily processes. “Look at it this way: A is an essential amino acid and B is a non-essential amino acid. Together, they form protein AB. If B isn’t present in the diet, that’s ok because its non-essential – meaning your body will then go and make it. 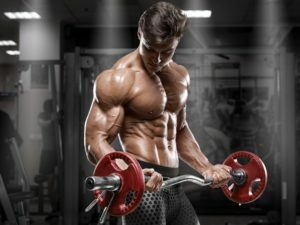 What if protein AB is required to repair your muscles, produce testosterone, or to simply perform? Nothing will happen until you eat. While 1 gram of these EAAs (not including BCAAs) isn’t a landslide of quantity, is enough to appreciate getting versus not getting in a BCAA supplement. Origin Amino Contains a 2.1 Gram Electrolyte Blend with Coconut Powder. In each serving of Origin Amino, you will be getting 1,200 milligrams of coconut water powder, 275 mg disodium phosphate, 247 mg dipotassium phosphate, 220 mg magnesium phosphate, and 141 mg calcium carbonate. This covers all of the electrolytes that keep specific pathways going in your body, which, under extreme performance and sweating can become depleted. To us, this is Gatorade without all the sugar, as one small component of this mighty BCAA. We’ve taken Origin Amino in the gym as both its own stim-free pre workout as well as an intra-workout after taking ORIGIN PRE. As its own pre workout, we noticed a massive endurance increase and reduced muscle soreness the next day. It tasted good, and was easy to down before hitting the gym. Alternatively, intra-workout is where this BCAA really shined! It took the pre workout to that ‘next level’ and made our endurance last forever. Plus, having an intra-workout to sip on made staying hydrated more quantifiable. Like the first scenario, taking Origin Amino definitely helped to reduce muscle soreness the next day, allowing us to come back to the gym stronger and stronger. There are plenty of BCAA supplements out there on the market, but very few actually deliver on their promises the way that ORIGIN AMINO does. Huge clinically effective BCAA dosages, accessory ingredients, amazing taste, and a modest price tag. It’s no wonder the brand ORIGIN is growing faster than any other supplement company at the moment. Honesty and quality is in full trend. We encourage you to learn more about ORIGIN AMINO BCAA right here on their site.